Built with Edutainment complete entertainment facilities, and outbound hall arena, the arena will be presented a lot of games that sharpen the brain and challenging, so that will make people addicted and reluctant to go home. Also according to Dani, as the manager of ST Marketing Nagoya City Walk, this property has advantages not possessed by other shopping centers. "Therefore we dare to positioned themselves, and brought the slogan or tag line Nagoya City Walk, The Excitement in Here (The joy of here)" said Dani. Until now, Nagoya City Walk continues still in the design stage, and began to carry out development activities and planning the concept of entertainment. However, some national stand already expressed interest in the Nagoya City Walk both those in the entertainment, food franchises, clothing, and other products. In line with Dani, the President Director (President Director) PT Supreme Dawn Development, Adhi Kusuma said, Nagoya City Walk drafted into an area of natural character with a mall atmosphere. However, in Nagoya City Walk more enjoy, quiet atmosphere, and provide revolutionary new style (lifestyle) for a modern shopping center. 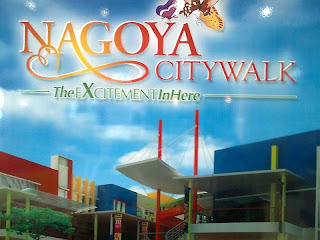 That said, the city will focus activities in Nagoya City Walk this. Nagoya City Walk was built in the area of 4 hectares with two blocks of 114 units of shophouses. The second block of this shop, each one facing the street and another side facing the city wide walk 9 to 12 meters. Commercial, built with three levels, where the second floor lobby will be built shophouses three-meter wide that connects this shop. Later in the middle of the Nagoya City Walk will be built to resemble Central-Dome Amphitheater with an area of about 1000 square meters. Central-Dome at this, can do various activities that can accommodate 1000 visitors. Like the concert event, product launch even weddings can be.